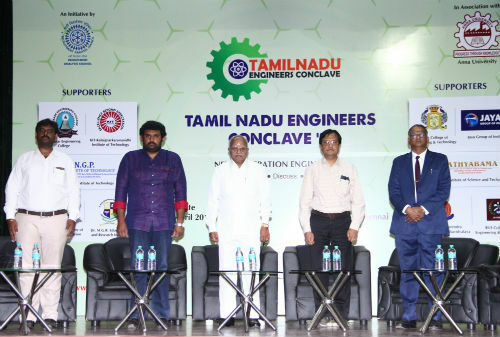 Chennai: Recruitment Analysis Council in association with Anna University conducted “Tamil Nadu Engineers Conclave’ 18” – for Next Generation Engineers was held recently , Saturday, 21st April, 2018 at Vivekananda Auditorium, Anna University, Chennai. The Conclave inaugurated by Hon’ble Justice Dr. T.N. Vallinayagam,Judge – Lok Adalat & Former Judge – High Court of Madras & Karnataka and President – Recruitment Analysis Council. Dr. S. Amar Prasad Reddy,Board Chair – Recruitment Analysis Council and Director – General, National Cyber Safety and Security Standards. Dr. S.S. Mantha, Member, Karnataka Skill Development Authority, Government of Karnataka and Former Chairman – All India Council for Technical Education (AICTE). Dr. M. Arul Arasu,Additional Director (Exams), Directorate of Technical Education (DOTE), Govt. of Tamil Nadu. Mr. E. Khalieraaj, Addl. Director – General, National Cyber Safety and Security Standards and Director – Academic & Corporate Affairs, Recruitment Analysis Council were present the inauguration of the event. According to a report, there are 799 Universities, 39071 colleges and 11923 Stand Alone Institutions apprx in India. In Tamil Nadu, 150 engineering colleges get less than 30 per cent students. As per the All India Council for Technical Education (AICTE) norms, if engineering colleges attract less than 30 per cent of students for three consecutive years they will be closed down. This year the vacant seats in the engineering counseling will be around 90,000 which is less than 10,000 compared to last year. For example, “Delhi has less than 100 engineering colleges but they are quality institutions in terms of providing placements to their students. In Tamil Nadu, the ratio of college seats per student is uneven. Having a very high number of colleges also may lead to a decline in quality. In this regard, “Tamil Nadu Engineers Conclave’ 18” (for Next Generation Engineers) will show the hidden employment and entrepreneurship opportunities in the engineering domain and the skills to be improved to grab the opportunities. “In 2016, Indian Government has funded around 80,000 startups. Out of these startups, some will shape the future of India at a long run. At present, India requires technology startups and companies than service based ones in order to be in par with countries like Japan, China, Germany. The problems which are facing today and the problems expected to arise in the first half of the twenty-first century, the engineering profession must revisit its mindset and adopt a new mission statement – to contribute to the building of a more sustainable, stable, and equitable world. Current graduates will be called upon to make decisions in a socio-geo-political environment quite different from that of today. Clearly, engineers must complement their technical and analytical capabilities with a broad understanding of so-called “soft” issues that are nontechnical. Experience has shown that social, environmental, economic, cultural, and ethical aspects of a project are often more important than the technical aspects. An issue of equal importance is the education of engineers interested in addressing problems specific to developing communities. These include water provisioning and purification, sanitation, power production, shelter, site planning, infrastructure, food production and distribution, and communication, among many others. Most of our engineers are not educated to address the needs of the most destitute people on our planet, many of them living in industrialized countries. This is unfortunate, because an estimated 20 percent of the world’s population lacks clean water, 40 percent lacks adequate sanitation, and 20 percent lacks adequate housing. It is clear that engineering education needs to be changed or even reinvented to address the challenges associated with these global problems.